Fargo’s cat cafe caters just to cats! Fargo, ND – The new and hip trend of having restaurants specifically for our feline friends has finally come to Fargo! Cathy’s Cat Cafe will cater to cats by offering a full catalog of favorite cat foods and fun. Every category of toys, teasers, challenges, and scratch posts will surround your cat’s culinary experience at Cathy’s Cat Cafe. 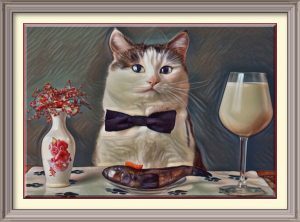 Food specials such as catfish deglazed with catsup wine sauce will make your cat as happy as a catholic in a catacomb cathedral. Recreational catnip will be available throughout your cat’s visit, since it is now legal in the state of North Dakota!